every year around this time i begin to mourn the loss of my jeans. which is funny because i don't consider myself one of those people that loves their jeans, turns out, i do. also it turns out that i really love them. i want to always wear them. always. but at the same time i am not a fan of over heating and dc in the summer equals overheating when wearing jeans. it is stupid hot here. stupid hot. which leads me to the summer dress search. i've a few in my closet that have lasted me for forever but mostly i find that my tastes change on a yearly basis when it comes to dresses. this is frustrating because i find myself wanting to spend a cool five thousand dollars on light and airy swathes of cloth when my budget is approximately thirty seven. this year i want tunics and relatively shapeless. also, apparently, navy. done am i with those elastic cinched waists* and belts**. though if eastern market this weekend was any indication of what is to come i'm in the minority because everyone was wearing a big ol' giant belt with their skimpy little summer dress. oh dc, why, WHY? Oh yes! 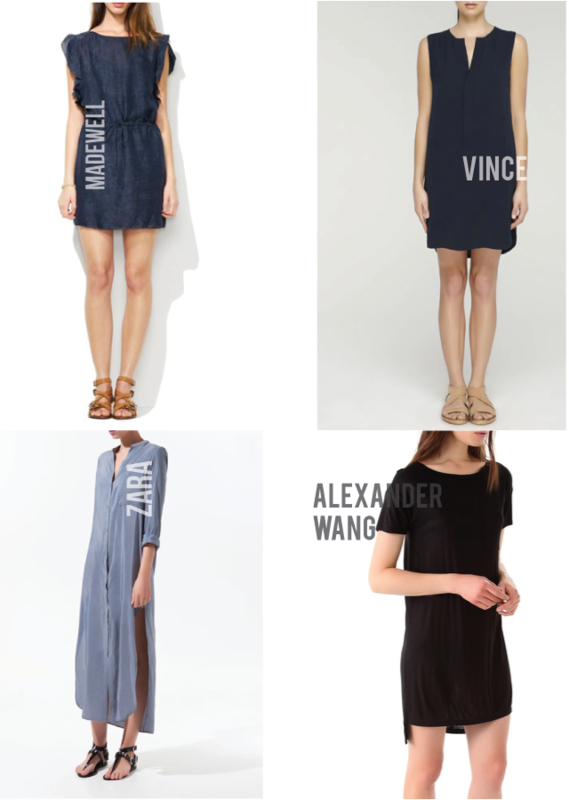 Love the sweet simplicity of all these dresses. I can already see myself in the Madewell and Wang ones. i could never get on board with the wide belts. i used to think that it was because i looked ridiculous in them, but then i realized that EVERYONE looks ridiculous in them. such an unflattering trend. why would anyone want to accentuate their RIBCAGE? i tried doing the skinny belt, but that didn't work for me either. so i stuck to a medium belt (like 1.5 inches wide). i have a brown worn leather one that i threw over everything, but i am growing tired of that look, too. all that being said, i am currently looking for the perfect black tent dress. if you find it, please let me know.